More Around the Block for the month of November. Lynn from Craftstew requested blocks with a variation on zig zag, any block as long as it incorporates at least one zig or one zag. 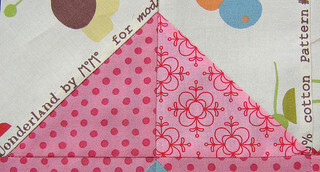 The fabrics Lynn selected are from the Moda Wonderland by MoMo range; adding solid fabrics within the general color palette. The zig zag variation theme was fun and easy to work with, I think this is going to be a truly unique quilt. I hope you like your blocks Lynn! Lovely blocks Rita and I agree with you...Lynn's quilt will be so unique. I can't wait to see the finished product! your blocks are wonderful! i especially like the one on the left with the offset zig (or zag). Rita, I love them and I am blown away! The blocks are truly gorgeous. Thanks so much! Very cute -- you always do such a beautiful job! Nicely done Rita :) I like those instructions "... at least one zig or one zag." hehe! Very cute and very different. So much fun! Very nice. 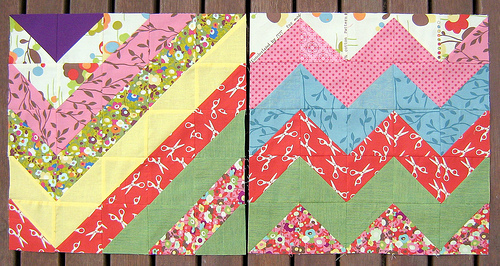 Beautiful zig zag blocks - what a great variation. Very cool! Love the "1 zig or 1 zag" requirement =) I need to decide what block to have everyone make for a VQB I'm in.... for January! Gah! Thats coming up soon! great blocks!! i like how you went traditional zig zag with the one.. and not so much with the other!